More than 350,000 tickets have already been sold to what Dr Zahi Hawass, secretary general of Egypt’s Supreme Council of Antiquties, described as the ‘longest comeback tour’ in history. ‘Tutankhamun and the Golden Age of the Pharaohs’ will mark the first time any of the boy king’s treasures have been seen in the UK in 35 years, but what will visitors see ? and possibly more importantly, will it be what they expect? Expectations are high due to the memories of the record-breaking 1972 exhibition, when 1.6 million visitors, myself included, were astonished by the golden treasures on display. Many eminent Egyptologists have declared that that was the defining moment for them, their life’s work chosen in a moment that changed them forever. It didn’t make me an Egyptologist (sadly), but it made me passionate about the culture. I don’t remember many of the details, but I remember being round-eyed with wonder, much as Carter must have been on seeing the contents of the tomb (he declared ‘everywhere the glint of gold’). The sheer number of artefacts and their quality was staggering. The new exhibition seeks to put the king’s brief reign into context ? out of 130 exhibits 80 are from the time of his predecessors. And although this is a very laudable aim, it may not be what people are expecting. Only seven of the exhibits from 1972 have returned, and there are none of the shop-stoppers. The familiar face that adorns the posters comes from a canopic jar (which held the king’s liver) ? 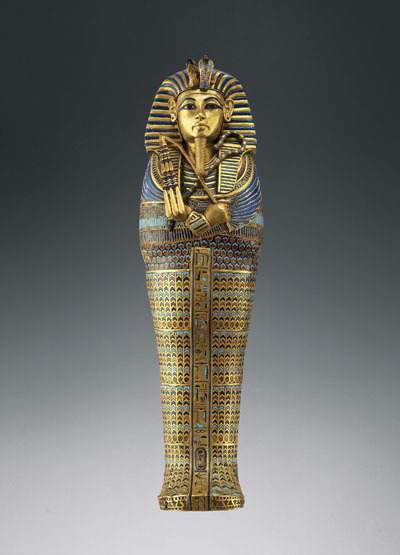 the sarcophagi that we all recognise have been deemed too fragile to travel. There is a golden coffin, but it belongs to Tutankhamun’s great- grandmother Tjuya ? her tomb was considered the greatest discovery until the opening of Tutankhamun’s tomb some 17 years later. The magnificence of Tutankhamun’s funereal finery means that we assume he was more important than he was. In reality, he was quite a minor king. Indeed, his importance lies in how significant his father was. Akenaten overthrew everything about Egyptian culture ? the religion (he worshipped one god), the art, the capital ? and the exhibition seeks to show the radical changes made by him. And it’s here that the exhibition really scores. Hopefully, it will bring that period to wider public attention. The UK version has an extra gallery which looks at the excavation of the tomb with film footage of Carter and Carnavon. The audio commentary is excellent (even if means everyone clumps around at the same time) and is delivered by Omar Sharif (such a lovely voice). It’ll keep you occupied while you wait to look at the next case. Happily, the descriptive signs for each exhibit are given both by the item and on top of the case in bigger print ? handy if you can’t get close. I can’t say I was impressed with the shop ? all the items are almost prohibitively expensive (even a postcard is 95p) and many are just trashy, which is a shame. A DVD of the exhibition isn’t exactly a snip at £35, even if it is excellent. A percentage of the proceeds from the exhibition and the shop will go to fund the establishment of museums and research/conservation in Egypt, and judging by the tone of Dr Hawass’s comments, we will have to pay and pay in the future too. But will the show have the broad appeal of the 1972 exhibition or even of the First Emperor show at the British Museum? Sadly, probably not. If you’re interested in the period, there is much to delight. But if you’re looking for the wow factor, you’ll be disappointed.